Your gang has been tasked by a local miners' guild to eliminate a creature that’s been nesting in one of the newly-abandoned domes. The creature only leaves its lair during lights down and its lair is very well concealed, so it is imperative to kill it before darkness descends. Well, better late than never I guess. 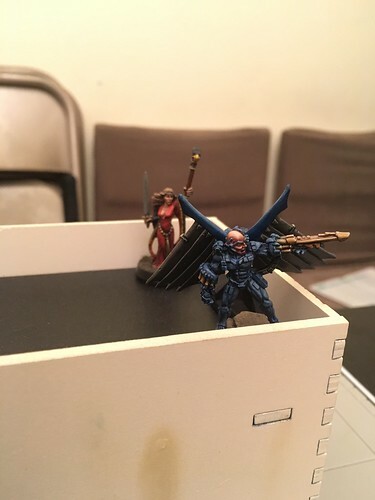 I kept wanting to get in on this league but could never get my girls to the top of my painting queue until now. 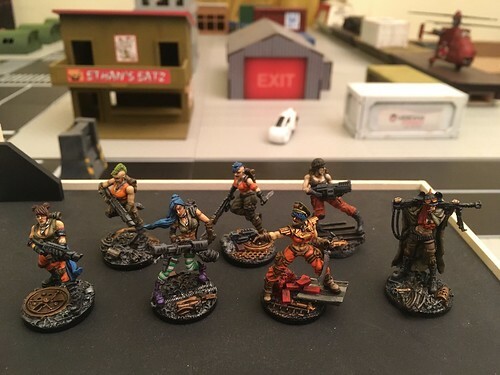 In this game, I did not have all of them fully painted, but they are now, and I posted about them here: Jail Birds. I apologize up front for the short descriptions as the game took place a while ago already (October sometime I believe) but due to Dave's trip and then health issues we are just getting the pictures and write up done now. The game started with most of us spread out. Deployment is pick a point anywhere then pull a chit from the cup, whomever chit it is places a figure there. Dave played cagey with most of his men hidden in far corners of the board. Needing to engage and shoot early I deployed as centrally as I could every time I could. I managed to get a bolt rifle up high in the middle of the table and a grenade launcher on a flank. Spyrers! The most broken gang there is! Which is the main reason I used to play them!!! 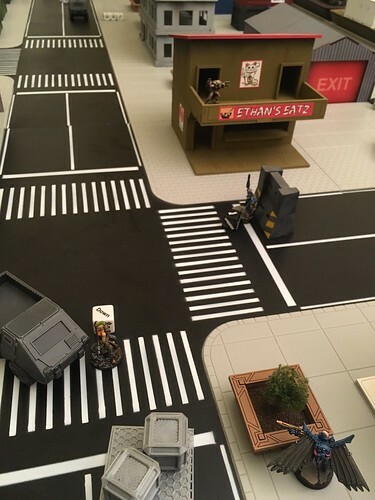 I started moving in and setting up my angles of fire, but of course my first reserve had a mishap and Dave got to place her off in the corner to play by herself the whole game. Nothing much happened on my turn, as I just moved around. 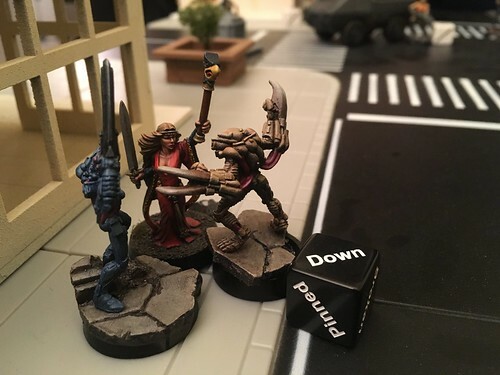 Some good luck happened on Dave's turn one when the "Monster" showed up behind his Yeld. Hmmm.... that's the evil monster we are all trying to stop and kill? I could think of some other ways to distract the "monster". 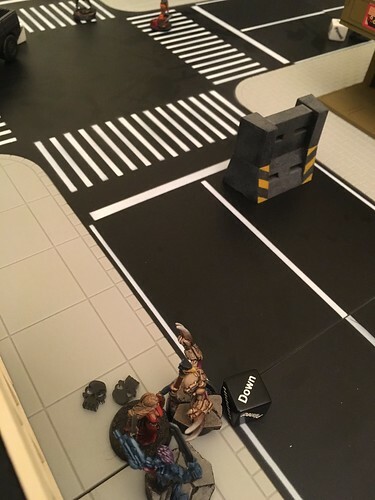 However, Dave started to open up and took out 2 models with his close combat monsters and downed another with shooting. 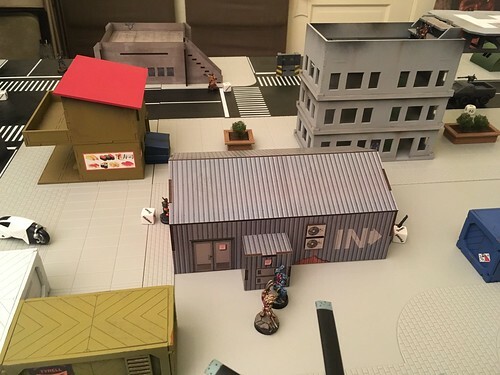 The issue with downing one with shooting was that the "monster" that was on the building just off camera to the left in the above picture, could now only see and charge the Yeld. Off in the middle of the battlefield 2 of my girls were taken down and I was trying to escape to either side of the building away from 2 close combat beasts. Back on the edge of the table, the Yeld tried to get away from the Monster but was charged again, and this time taken down. 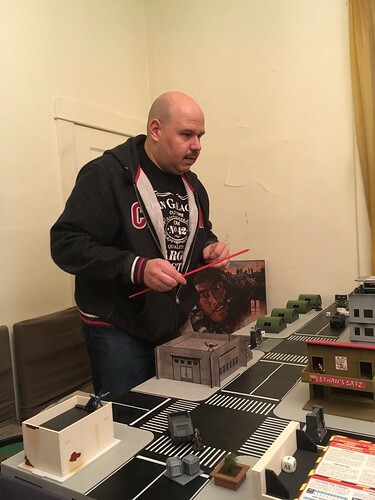 With the Yeld down, but one wound put onto the Monster, Dave sent in another ganger to help take it out, however that didn't work either. You can just see at the top of the picture below, the bases of 2 of my girls. There were actually 4 there and they lined up in a firing line to shoot into combat. Also the grenade launcher that you can see peeking around the corner in the picture above lined up a shot as well. After all, if I hit Dave's figures it helps me, if I hit the Monster, it helps me.... How could I lose! Well.... I almost did. Everyone fired and missed everything or failed to hurt anything. I was down to the last model to fire. 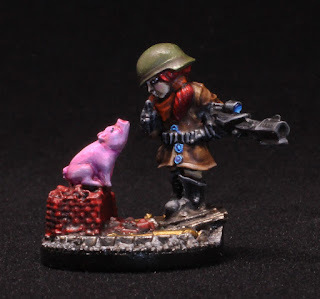 My lowly juve that is scolding her pet pig about the patience and practice required to hit a target and that piglet really must keep quiet as she aims. The scolding must have worked, as her piglet kept quiet and her aim was true as she put the last wound on the monster and won my gang the game! Byron (Eschers): (2 league games played) 14 pts. 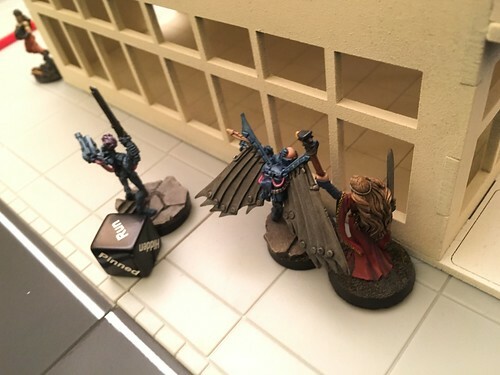 Great paint work, terrain and gaming here guys - well done. Dave - hope you are doing well!